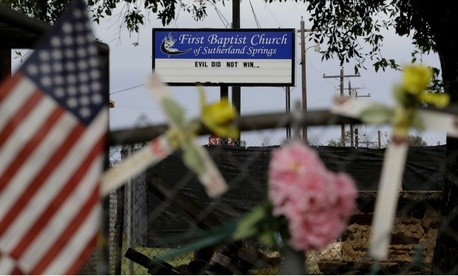 Special agents in Air Force security had four opportunities to head off firearms purchases by the troubled veteran who went on to murder 26 parishioners of the First Baptist Church of Sutherland Springs, Texas, on Nov. 5, 2017, according to a long-awaited watchdog report out on Thursday. Devin Kelley, who killed himself after fleeing from the site of the shooting, was on record for a checkered Air Force career beginning in 2009, including charges of domestic abuse and time in the brig. Going back to his high school years in 2006, Kelley had been arrested for marijuana possession, receiving six months’ probation and community service. He was expelled from high school, but enrolled in an alternative program. With a diploma, he enlisted in San Antonino, answering “no” to a question about whether he had ever experimented with marijuana. On the Holloman Air Force Base in New Mexico in 2011, Kelley received multiple disciplinary actions, among them improper use of cellphones, wearing earphones while in uniform, missing medical appointments and not properly accounting for property borrowed as well as four violations of the Uniform Code of Military Justice. After dating and marrying Tessa Kelley, who had a son from a previous relationship, he was reported for violence against both family members. On base he was put in behavioral health services and pre-trial confinement and was later listed as a suicide risk. The wife reported his assaults to the 49th Security Forces Squadron, and he eventually confessed. In 2012, the base security issued a protective order for the wife. Kelley was later convicted and incarcerated in January 2013. On May 9, 2014, after the automatic appeals courts upheld Kelley’s conviction and sentence, he was officially separated from the USAF with a Bad Conduct Discharge. Remarried, he purchased firearms from 2012-2017, before planning for the shooting in the fall of 2017, all of which the IG traced. To head off a repeat of such a lapse, the IG recommended that the Air Force revise its records management to require submission of fingerprints, and that the Air Force Recruiting Service check candidates against records of the National Crime Information Center and local criminal histories. It recommended more formal training on procedures for submission of fingerprints to the FBI, and notations in the performance files of the unnamed managers who failed to submit fingerprints and other records. More ambitiously, having studied the 1968 Gun Control Act, Brady Act and Lautenberg Amendments, the IG recommend that the undersecretary of Defense for Intelligence and the general counsel of the Defense Department consider pursuing legislation amending the Gun Control Act to specifically include commander-issued no contact orders and Military Protective Orders as disqualifiers in determining eligibility to purchase firearms.